I find that my banana baked good consumption is getting a bit out of control. Well, maybe not my consumption, but definitely my… development? Is that the proper word? Not like you’re surprised. I exploit this fruit more than any other and essentially stuff it into… well, anything that I can. Blah blah blah. Nothing you don’t know, right? I was a bit freaked out at what the banana would do to the scones. You know, it makes things kinda cakey? But good news: no cakey scones here. I found that it made the texture slightly lighter and perhaps a bit fluffier, which is only a bonus to me since I was never a fan of scones until I started making this recipe anyway. Scones were like bricks for breakfast. And even worse, they were often eaten while drinking coffee. So a few years ago they would have been my worst nightmare. I’m so glad my life has changed. Oh yeah. Important note: I covered these in brown butter glaze. Actually, I could help myself if I wanted to, but 1. I don’t want to and 2. I remembered these banana spice muffins with brown butter glaze and determined that the scones had to be glazed or else I would die. It was a matter of life or death people. In a large bowl, whisk together flour, sugar, baking powder, soda, salt and cinnamon until combined. Add butter and using your fingers, a fork or a pastry blender mix it together and combine until the butter forms coarse little crumbs. I usually take a full 2-3 minutes and do this with my fingers. Make a well in the center and add in buttermilk, vanilla extract and bananas. Mix with a large spoon until a dough forms and comes together – it might be sticky! Add in chocolate chips if desired. Just make sure your hands are floured and so is your work surface. Divide the dough in half and pat it into 6-inch circles on the floured surface. Cut into 6 or 8 wedges, then place on a baking sheet and bake for 10-12 minutes. Top with glaze and serve! In a large bowl combine brown butter, vanilla extract and powdered sugar. Whisk until the mixture comes together then add in 1 tablespoon of milk, continuing to mix. I always stir my glazes for a good 3-4 minutes so they really come together. If it still doesn’t appear glaze-like, add in milk 1/2 tablespoon at a time and mix again. Don’t worry if it becomes too liquidy – just add a tiny bit of powdered sugar until you get the desired consistency. AND chocolate chips. Yes to chocolate chips! Caprese Shells with Mini Meatballs. I love adding bananas to baked goods! Always makes them feel a bit healthier, right? Can’t wait to try these! The bomb…..Could I possibly use mini WHITE chocolate chips without destroying the wonderfulness of your recipe? ?…Or caramel bits?…So weirdly not a huge fan of regular “brown” chocolate! They look so yummy! And you’re right, bananas do add a cake-y texture pretty much to everything and that’s way I love to incorporate them pretty much to all my baked goods! I’ll be trying these out to complete my list of banana-treats! Yum I love scones and bananas! Never thought to combine both =) I was planning on halving the recipe because its just for myself. Do you think it would still work texture-wise keeping the number of bananas used as 2? I don’t want to lose the banana flavor in the scones by just using 1! I have a slight scone obsession, and have been making every recipe I can find. I’ve never tried a banana version before. Do you think these would freeze well? thank you for these. I love banana anything and banana scones are some of my favorite. But add that glaze and chocolate chips and they are perfect. These look perfect, I’m making them on Saturday. It allows me to use the rest of the buttermilk and add scones to my freezer stash. Plus my son will love the chocolate chips. I love being able to offer him a treat on a weekend morning by pulling an unbaked scone or two out of the freezer, baking it up and having fresh scones for breakfast. As I sit eating a maple walnut scone from Starbucks I wonder why I don’t make my own more often. I have to admit, I sort of like the hard, not cakey thing…better to dip my scone into coffee my dear! 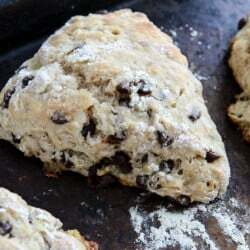 Yum- i am going to try scone, starting with your recipe, but looking for the sofe scone + toffe. I LOVE bananas, but dislike banana bread…. weird?? I can’t wait to try these. I just stuck 3 bananas in my freezer yesterday to use them at a later date. Now I know what I want to use them for. These are amazing. The scone itself isn’t real sweet – so the glaze is perfect with it. I’d never made brown butter on purpose – and it is caramely and delicious. I made these tonight and they are fantastic and super easy!! These are amazing. I’m lazy so I made them without the glaze, and still – fanfreakingtastic. I MADE THESE THIS MORNING. THEY WERE SO GOOD. Also, the first time I’ve ever browned butter. DELICIOUS. Aahhhh the only downside is that my boyfriend already ate 3, so I’ll be lucky to have any to take with me to work tomorrow morning. I am so trying these! My boyfriend buys (and promptly forgets about) bananas at least once a week, and I am SO TIRED of banana bread. I just can’t even deal. These scones look like the perfect thing to break up my banana-bread-y life. Thanks! These. look. amazing. I’m a banana freak, though I’m guilty of “saving” my bananas for later in the week . . . only to discover they’re already overripe. I’m always on the look-out for great banana baked good recipes, and voila! Definitely have to try these! I made these last weekend, and I’m making them again today — they’re so good! Yum! These are so good! I made these several days ago. 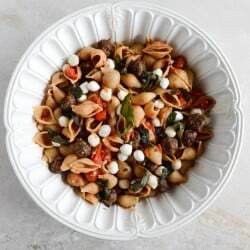 My husband and I both loved them – this recipe is a keeper! Thank you for sharing it. Hello there : ) I made these scones yesterday as an early Mother’s Day treat for my mama, and these were FAB-U-LOUS!!!!! They were…..fall back to the wall and sink to the floor good!! Thank you for the recipe!!! Oh my goodness – found this recipe a few days ago because I had some bananas ripening on my counter and didn’t just want to make banana bread…so I promised myself that if I did all of my dishes (my washer is broken and I am lazy, so, it was bad) that I could make these! And now that I’ve finally achieved my goal and sampled these scones after much anticipation, I can officially say they are THE best reward!!! Oh my goodness. I love them. The texture is perfect, and the glaze is fantastic. I added chopped 60% cacao chocolate and loved the flakes/chunks combo :) thank you for sharing!!!! These were the first scones I have ever made and they came out delicious!! I switched out the chocolate chips for peanut butter chips though. And you were right, the glaze totally makes them double amazing!! I make these scones pretty regularly and am totally in love! But, I want to try them with Whole Wheat Flour – not white whole wheat. Any advice on the conversion? Do you think it would be possible to substitute some or all of the all-purpose flour for some whole wheat pastry flour? yes! AP flour will work for sure. Here’s an update if you’re curious, I made these with half whole wheat pastry flour and half all-purpose and they were DELISH! 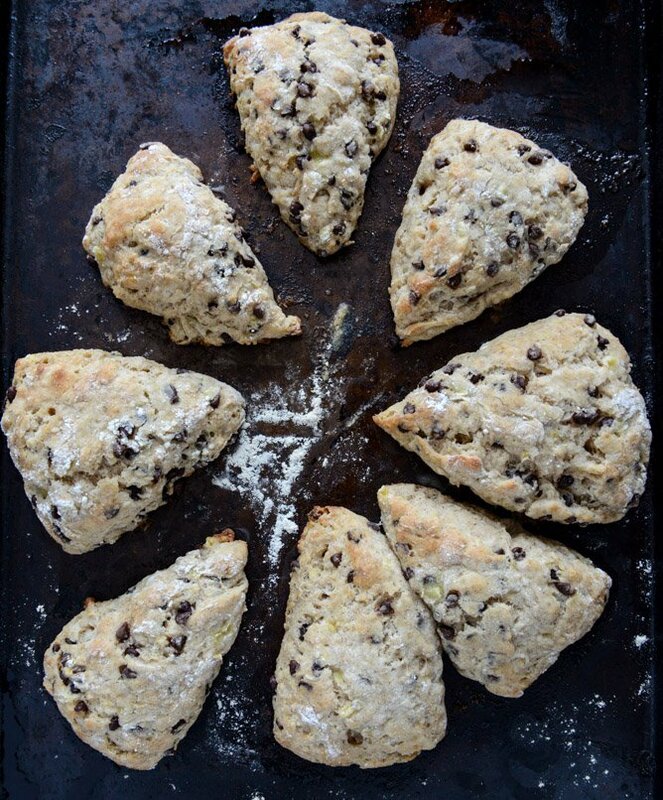 Pingback: Just Desserts: Banana Chocolate Chip Scones | wedo.